From this block you can learn more about managing updates and backups with CrocoBlock, changing settings and installing different skins. In order to access CrocoBlock Dashboard log in to WordPress and locate CrocoBlock on the left of the Dashboard. In this block, you can view the license key you’ve got from the CrocoBlock subscription that is currently active on the site. In the Status field you can see if the key is active now. Click Deactivate button if you want to deactivate the license on this site. Switch to Plugins tab. Here you can view the full list of Jet plugins available for installation and usage. Check for Updates - click this button in order to check the available updates for the plugins listed below. If the updates are already available, you’ll see the notice on the right of the plugin which newer version is currently available for download. Note, that you can also update the plugins in Plugins > Installed Plugins tab in WordPress Dashboard. Check for New Plugins - click this button in order to check if there are any new plugins have rolled out and are now available to be downloaded and used. Install - click this option to install the plugin that is available in your subscription, but hasn’t been installed on this site yet. Documentation - click this link to navigate to the plugin’s documentation. 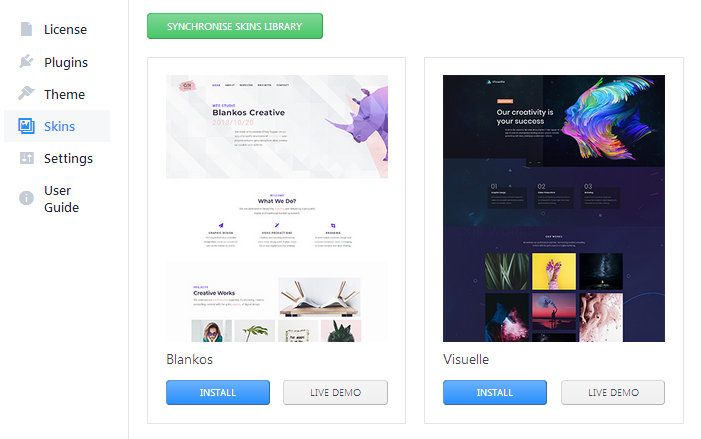 Synchronize Templates Library - click this option to synchronize the templates available in Magic Button (headers, footers, sections and pages). You can also view the current plugin’s version and see if it matches the version installed on your site on the right of the plugin’s shortcut. Navigate to CrocoBlock > Theme in WordPress Dashboard. Here you can see if Kava theme is installed and active on your site. You can view the theme’s version, and see if it is needed to be updated. In the case there is an update you’ll be able to click Update Now option. 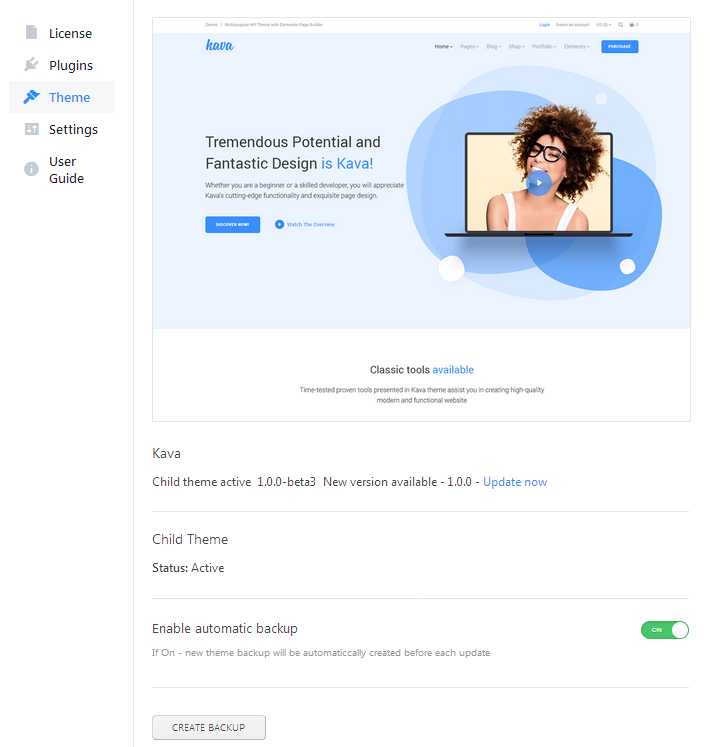 Child Theme block shows if the Child theme is currently installed and active on the site. It is recommended to install and use it in order to make all the further changes in theme’s styles safe. Enable automatic backup block - here you can enable the backups to be made automatically before each update. Create Backup button allows to create a backup manually whenever you want to make any changes in the theme before actually making them. Just click the button. A new backup version will be made. You can always download the backup or delete it is it is no longer needed. Open CrocoBlock > Skins to view all the available skins for your subscription. Install - click the button to install the skin on your site. It will be installed with all the required plugins and demo content via Jet Plugins Wizard. Live Demo - click this button to view the live demo of the skin. Synchronize Skins Library - click this button to update the list of the available skins and view the new ones. The new skins will be added with time. Navigate to CrocoBlock > Settings to view the JetThemeCore settings and manage them. Prevent Pro locations registration - enable this option to prevent Elementor Pro locations registration from JetThemeCore plugin, if your headers/ footers disappear when JetThemeCore plugin is active. Use nucleo-mini icon package - enable this option in order to add nucleo-mini icon package to Elementor icon picker control. Disable Container of Content on Archive Pages - here you can select the archive pages, where you want to disable container of content. Disable Container of Content on Single Pages - here you can select the single pages, where you want to disable container of content. 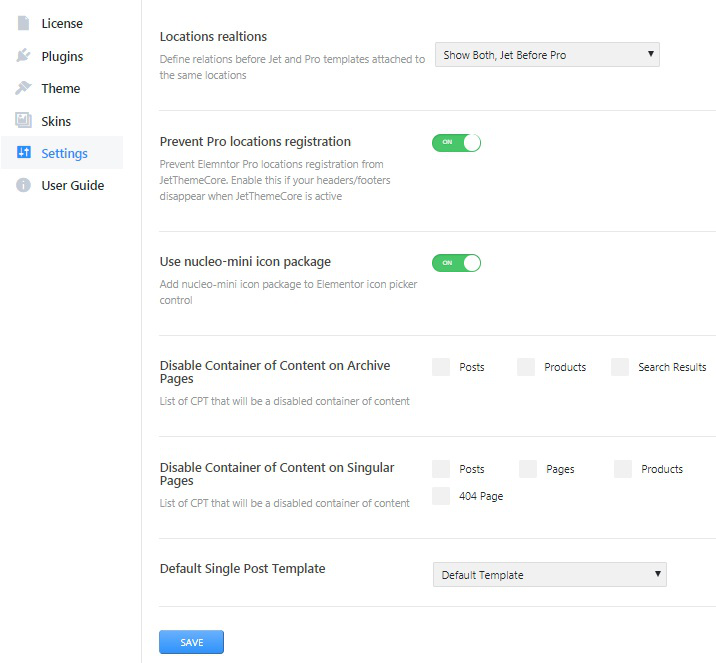 Default Single Post Template - here you can choose one of the page layouts from the dropdown list, which will be applied for single post templates by default. In this tab one can learn more about CrocoBlock. In the case you need to access knowledge base or CrocoBlock community, use this tab.